Standing on the doorstep of history, Chelsea saw off the challenge of a very good Stoke City side, defeating the visitors by a 4-2 final score. A brace from Willian gave the Blues a lead they would not relinquish and a late goal from Diego Costa sealed the win for the Blues as they match Arsenal’s record of 13 consecutive wins in a season with their win over Stoke. Fair play to Stoke, however. 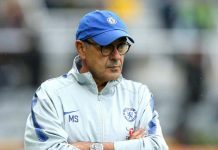 Mark Hughes’ side certainly came to Stamford Bridge looking to end this Chelsea run, equalising twice before finally succumbing to the quality of this Chelsea side. Stoke employed their own back three, a common tactic against Chelsea these days, but used a very physical pressing game in their own half to frustrate the home side in the early stages and limiting their chances. Chelsea got their first breakthrough through a bit of good fortune. Costa controlled a long ball and unleashed a volley that Lee Grant was able to parry off of a defender on the line. Minutes later, Gary Cahill rose to meet a corner from Cesc Fabregas, but Grant was able to scramble to his left to make the save. Cahill would put the Blues ahead just after the half-hour mark from another Fabregas corner as he rose above his marker to thump a header past Grant to give the home side the advantage. That advantage would be erased just after the half when Bruno Martins Indi latched on to a Peter Crouch knockdown from a free kick to give the visitors an equaliser. Chelsea would go ahead once again just before the hour when Willian lashed home from just inside the area. 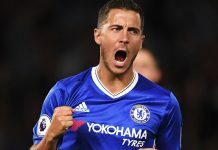 In the build-up, Victor Moses got to the byline by leaving Stoke defender Erik Pieters for dead, and Hazard was able to lay off his cross to Willian who made no mistake. Peter Crouch made the score 2-2 just minutes later. Chelsea failed to clear their lines properly after Bojan was dispossessed on the edge of the area, and the ball broke to Mame Biram Diouf. 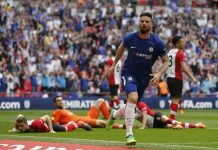 His cross found Crouch who had stolen a march on Cesar Azpilicueta, and the big striker bundled home from just inside the six-yard box. Willian made in 3-2 almost immediately with another thumping finish. Fabregas was given far too much room to pick out a pass, and his through ball through the right channel for Willian to lash into the roof of the net. Costa sealed the points just before the final whistle, collecting the ball with his back to goal and bullying Martins Indi to create space for a vicious shot just inside the near post, allowing the Blues to look to eclipse Arsenal’s single-season record on Wednesday at White Hart Lane.